MIKEL AT CHELSEA, BAD FOR NIGERIA? For about forty minutes during the first half of the Nigeria vs Uruguay match at the 2013 FIFA Confederations cup, the clock was rolled back, the spell was lifted – albeit short lived – and Mikel John Obi, the former teen prodigy, ‘fought’ over by the greats of modern football, Chelsea and Manchester United, displayed the panache and skills we first knew him with, capping it with a well taken goal resplendent of Kanu Nwankwo’s ‘golden goal’ against Brazil at the Olympics in Atlanta. At half time we poured encomiums on Mikel, but alas, in the second half he reverted to type – defensive minded, non exuberant cautious play, which Mourinho, that self-declared Special One, turned him into. And therein lies my grouse. I want Mikel to be on fire when he plays for the Super Eagles not putting out flames. Against Uruguay, he sparked a bit – the first time post Chelsea – and the difference was clear. But old habits die hard and in the second half he lapsed back to old ways. Chelsea blunting Mikel’s attacking instincts has impacted negatively on Nigeria’s national team. At the African Nation’s cup, the Eagles triumphed through graft and Sunday Mba’s ‘Vieiraesque’ performance. At the level of the Europeans and South Americans, we need more than graft. We need flair, guile and vision. 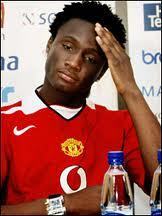 We need a proper number 10 or as the Brazilians say ‘Numero dez.’ We need Mikel Obi to actualise his promise. As I pen this piece Jose Mourinho has returned to Chelsea. The architect of Mikel’s conversion from attacker to defender, and a proponent of ‘containment’ football and ‘parking the bus,’ his comeback will certainly not favour the young man nor the Super Eagles. So I say, Galatasaray where are you? This entry was tagged Confederations cup, FIFA world youth championship, Messi, Mikel Obi, Super Eagles, Uruguay. Bookmark the permalink.